Today I want to share something with you that I think of as not only quintessentially September, but quintessentially North Carolina. Muscadines, Scuppernongs, and Scuppernong Wine. If you’re not from around these here parts, you probably don’t know what I’m talking about, because muscadines are a type of wild-growing grape that is native only to the Southern States of America, and most prolific in the North Carolina Tidewater region. Muscadines are different from other grapes. They are freakin’ HUGE, for one thing. They also don’t grow in clusters, like grapes. You just shake them off the vines like berries. The taste is haunting, sweet yet musky. The skin is inedible – well, I take that back, you COULD eat the skin, you just wouldn’t want to. To eat a muscadine or scuppernong, pop one whole in your mouth and shut your lips tightly. Bring the roof of your mouth down hard against the grape, or … gently … bite it so the innards pop out of the skin. Eat the pulp, then spit out the seeds and skin. Of course, spitting is more acceptable if you’re actually outside amongst the vines. If you are indoors, you may prefer to discretely use a napkin. 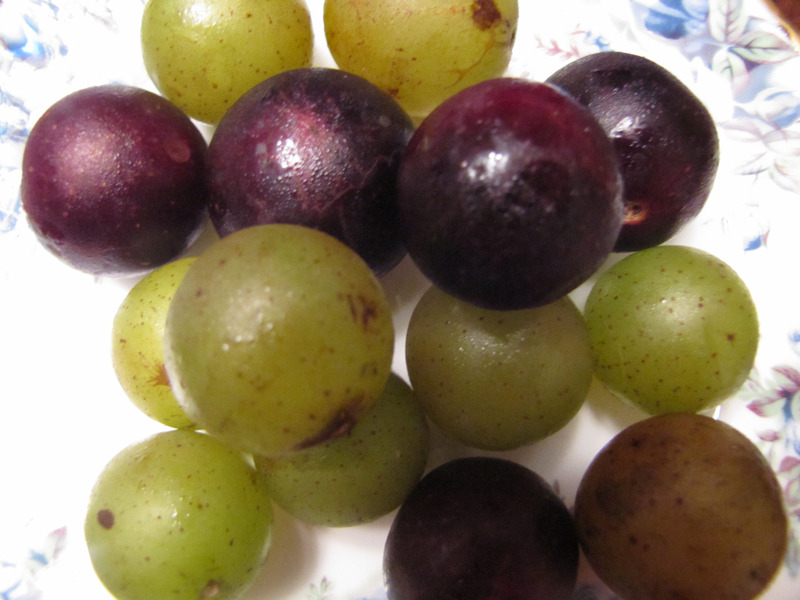 Black and purple fruits are called muscadines; the pale green ones are scuppernongs. And it’s the scuppernongs I remember most from all those late summer/early Autumn beach trips with my mom. We always went to the beach off-season; we could stay in nicer places and didn’t have to fight crowds. We liked tourist attractions and theme parks better when they were a little empty and wistful. We liked seeing the beaches packed with sandpipers, not swimsuits. Munching on a supply of scuppernongs was always a part of these trips. I didn’t know the reason – then. I didn’t know we were in Scuppernong country in the heart of Scuppernong season. I just understood it was a part of our beach trips together. As, were, later, the bottles of Scuppernong wine we shared. So I always feel nostalgic when I begin seeing muscadines and scuppernongs in grocery stores in Autumn. I always have to buy one package. And it always makes me think of sea and salt winds and sandpipers. There are recipes for Scuppernongs – you could make jelly. Or pie. But I would think making either would be a pain, as you would have to discard each skin. I have better things to do with my time than peel grapes. And, besides, any Southerner knows the best way to enjoy muscadines and scuppernongs – besides eating them raw – is wine! 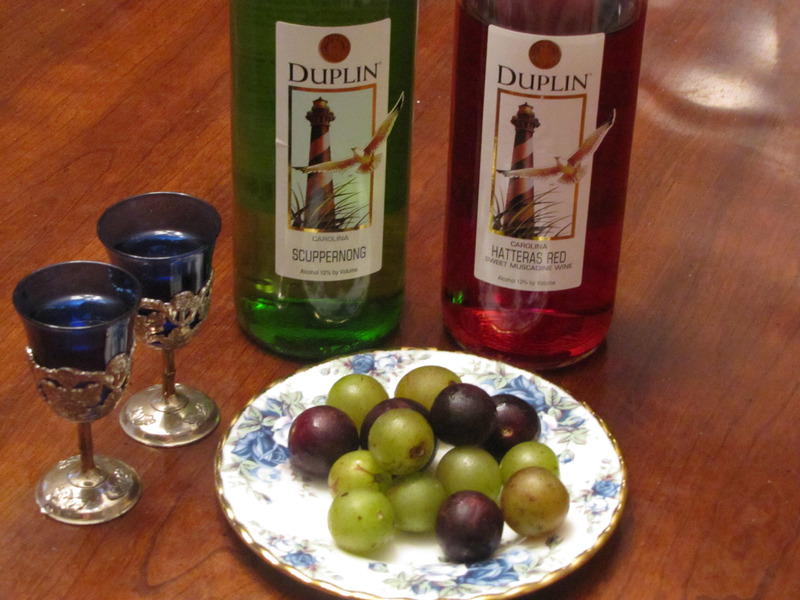 No, I’m not going to give you a wine-making recipe, but I WILL tell you that Duplin Wine Cellars in Rose Hill, NC makes a number of vegan-friendly Muscadine and Scuppernong wines! Scuppernong wine is very strong, and very sweet, and quite musky, so it’s basically a dessert wine. You’ll want to enjoy it served in small glasses, taking small sips. Happy MoFo to you! Cheers! « Vegan Crockpot Yogurt – Part II – PLUS A Recipe for Namkeen Lassi!